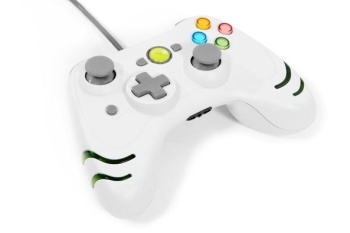 Microsoft has sued U.K.-based gaming accessory maker Datel, claiming that two of its controllers are a little too close to Microsoft's own Xbox 360 controllers for comfort. Microsoft filed suit in the U.S. District Court for Western Washington, claiming that the Datel "WildFire" and "TurboFire" controllers for the Xbox 360 infringe on several of Microsoft patents. The company is asking for compensatory damages including Datel's profits from sales of the two devices, plus interest and costs, as well as an injunction against "further acts of infringement." "We have a robust licensing program that ensures high standards and contributes to a great experience for the Xbox gamer community," Microsoft spokesman Kevin Kutz said in a statement. "We have a responsibility to protect that program and the companies that are part of it, as well as our own intellectual property." Microsoft's action follows closely behind Datel's own lawsuit against Microsoft over steps it took to make Datel's after-market memory cards for the Xbox 360 incompatible with the console. Microsoft's memory cards top out at 512 mb, while Datel's run as high as 4 gb, but in a November Dashboard update Microsoft disabled third-party memory card compatibility on the 360. "Microsoft has taken steps to render inoperable the competing Datel memory card for no visible purpose than to have that market entirely to themselves," Datel's attorney said in a statement. "We believe that with the power Microsoft enjoys in the market for Xbox accessories this conduct is unlawful." Anyone else smell a settlement coming?